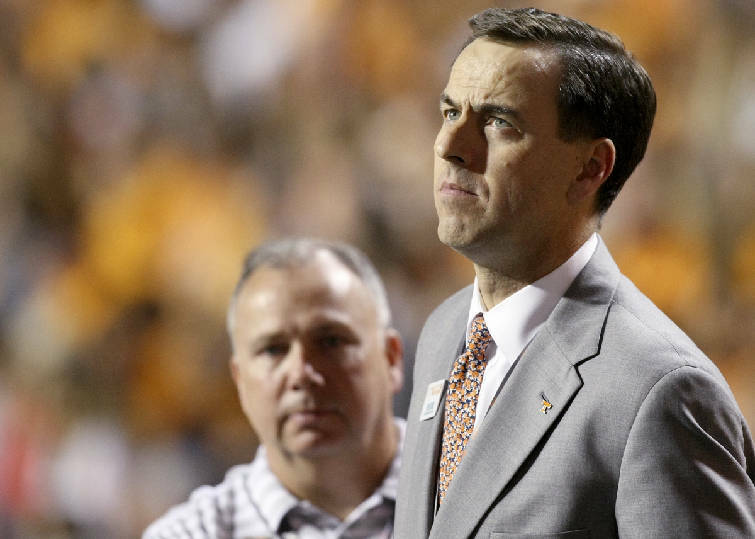 This story was updated May 2, 2018, at 11:59 p.m.
KNOXVILLE — In between temporary teaching gigs at Robert Morris University and Columbia University, former Tennessee athletic director John Currie is spending his spring as a baseball dad. Currie, who reached a $2.5 million settlement with Tennessee that was announced in March, expressed optimism for his professional future in a recent interview. "I like to be part of a team," Currie told Athletic Director U. "And I look forward to the next opportunity to be back on someone's team." Tennessee athletic director John Currie is seen on the sideline during an NCAA football game between Tennessee and Southern Mississippi at Neyland Stadium on Saturday, Nov. 4, 2017, in Knoxville, Tenn. In the meantime, Currie is taking in some of Knoxville West High School's baseball games. His son, Jack, is a junior for the Rebels, who are scheduled to begin district tournament play this weekend. One of the things Currie said he realized in the months after he was placed on administrative leave amid a tumultuous search for Tennessee's next football coach is how desensitized he had become to being away from his family. "I'm going to be more focused on continuing to make sure that I am present with my family, despite whatever work comes in," Currie said in the interview with Athletic Director U, an online publication geared toward those who work in collegiate athletics. Currie's interview with the website provided his most extensive public remarks since the December debacle that led to Phillip Fulmer being named Tennessee's athletic director. "First of all, we always have to stick with our core values and our integrity," Currie said in the interview. "I never wavered from mine in that process. We also have to remember that we have to be professionals. And despite whatever the circumstances are around us, we're the ones that are expected to operate with that integrity, protect our student-athletes and our institutions." Since his tenure at Tennessee ended, Currie spent a week as an executive-in-residence at Robert Morris in the Pittsburgh suburbs working with the university's sports management program. Later this month, he will spend a week teaching an intensive course in the sports management graduate program at Columbia in New York. "I'm incredibly grateful for the relationships that I've built over 25 years," Currie said in the Athletic Director U interview. "I've heard from so many people, some of whom I hadn't talked to in a long time, that told me they were thinking about me, that they trusted me and believed in me. I'm grateful for that. It's a great reminder about making sure that you do pay attention to your relationships and continue to keep those up through the years." Another lesson Currie has learned, he said, is about perseverance. "Tough times are going to come," Currie said. "Stuff is going to happen that's completely unprecedented and unforeseen, and you adapt to it and continue to drive forward." That's where his family enters the picture again. "They've been adaptable, and I've tried my best to set an example that when we go through trials and tribulations and adversity, we can't depart from who we are and we can't depart from our core values," Currie said. "We can't panic. We have to keep marching through, and we get on the other side and we look back and we realize that everybody goes through tough times, and it was our turn."